I am a cake person. I prefer cake. With the rare exception of the creamy pies (from scratch no-bake cheesecake, for example) or the annual pumpkin pie (yum), I rarely eat pie. Yet I am surrounded by people who love pie. 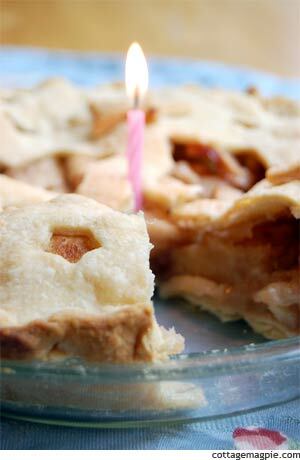 Who would rather have pie for their birthdays (gasp!). So, I make birthday pie. Hee hee. 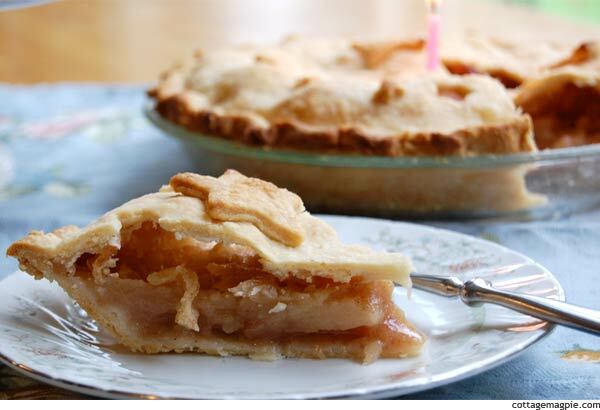 Fruit pie is best made with fresh seasonal produce, and fall is the perfect time to use some of the amazing apples that are available. Most of this pie was made with deliciously tart Granny Smith apples, but when I ran short I threw in a few Honeycrisp apples to fill it out. Pie is very forgiving, and more is usually better. Ingredients 6 cups of peeled, cored and sliced apples (about 6 large) 3/4 cup sugar 1 Tablespoon lemon juice (optional) 2 Tablespoons flour 1/2 teaspoon cinnamon Dash nutmeg 2 Tablespoons butter or equivalent Pastry for 2-crust, 9-inch pie I recommend organic sugar if you can get it, and if you use a butter substitute, I suggest trying a non-hydrogenated type. Any pastry you prefer will be fine. Method1. Preheat the oven to 400 degrees. Position your oven racks so that the top rack is in the middle and the bottom rack is below. Place a cookie sheet, pizza pan or a sheet of foil on the bottom rack to catch any overflowing pie filling. 2. Use half of your pastry to line a 9-inch pie plate. Let the other half rest while preparing the apples. 3. Peel, core and slice your apples and place in large bowl. I use a hand-crank apple peeler/corer/slicer and it goes really fast. I run the apples through and then just cut each spiral in half to make a stack of semi-circle slices. Sprinkle the apples with lemon juice if they are turning brown quickly or if they lack tartness. 4. To the apples, add the sugar, flour, cinnamon and nutmeg. Mix. 5. Pour the apple mixture into your prepared pie pan. Dot the top with the butter. 6. Use the other half of your pastry to cover the top of the pie. Cut steam vents and seal edges. You can use strips of foil to protect the edges of the pie crust, but I don't usually find that necessary. 7. Bake at 400 for 45-50 minutes or until done. You want to let the pie cool before slicing, unless you don't mind it when the filling all slides out! Otherwise, let it settle before you slice, and you'll get nice pieces that won't fall apart.